We stock a comprehensive range of quality cycles from top brands such as Kross and SCOTT, a complete selection of electric bikes and a vast range of cycle accessories. Our fully trained and experienced staff can service and repair all brands of cycles in our workshop, fully equipped with Park Tools. There is no need to book in advance, just pop in. While we work, you can enjoy a coffee and cake from our coffee shop. We’re an excellent starting point or destination for cycle clubs, with ample free parking available on site. 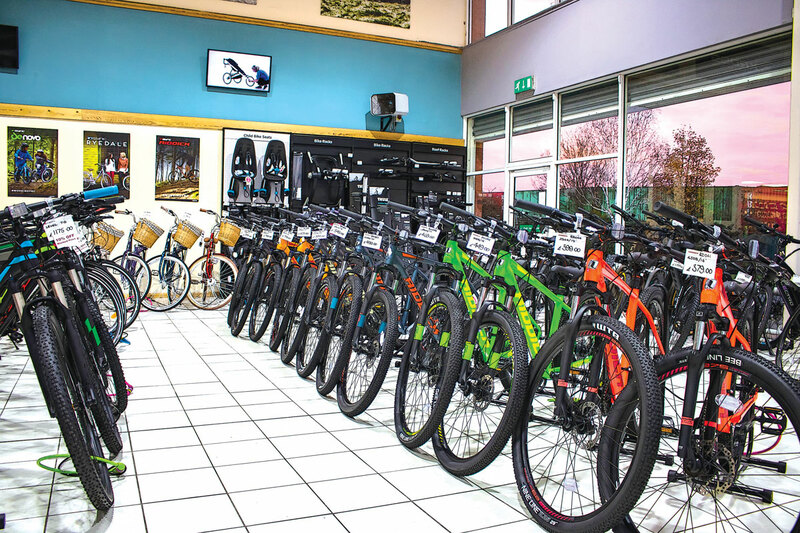 We have a massive range of folding bikes, electric bikes, road bikes, children’s bikes, mountain bikes, touring bikes, hybrid bikes, hardtail and full suspension bikes along with a vast range of accessories – racks, panniers, child seats and much more. Electric bikes are becoming ever more popular, giving the rider freedom to venture further with less effort. Great features like power-assisted pedalling make cycling less effort and more fun. Whether you are looking to avoid the rush hour, for help with the hills, or save money on insurance, tax and fuel, an electric bike could well be the answer. Pop in today for more information on the range, advice, or even a free test ride! 0% Finance is available on selected purchases. Ask in store for more details. Our Savers Club is an easy way to spread payments for your new bike throughout the year. Perfect for Christmas presents! Visit us at Mannaberg Way, choose the item you wish to reserve and our helpful team will keep this item for you until it is fully paid for. Savers Club cards can be started with as little as £10 with subsequent payments being a minimum of £10. You will be given a card to keep track of how much you have to go. Terms and conditions apply. We are part of the Cycle to Work scheme, which lets you spend up to £1000 on a bike and equipment – paying it off in multiple easy installments over the following year. For more information on how to join please ask a member of staff. Connect with us on Facebook and Instagram for all our latest news, events and offers. We are now on Twitter! We look forward to welcoming you to Scunthorpe’s new cycling destination. ©Cage A 2018, all rights reserved. Registered No. 1476510. VAT No. 444353066.